A last minute invitation to a home cooked meal is both a blessing and a slight inconvenience; as I cannot turn up empty handed, and in my case, it is almost always a home-made dessert that I bring. This particular evening's invite left me with scarcely an hour to prepare something sweet using only what I had on hand. Luckily I always keep a stash of frozen berries for cases like these, along with pantry staples such as flour, sugar and eggs which I never allow to dwindle too low. With these ingredients I was able to turn to an old, almost forgotten favourite, one that I haven't yet shared with you. I first made this blueberry pudding cake on a frost-bitten August evening some four odd years ago, before I began this blog. I hadn't made it since as my recipe record keeping wasn't yet cultivated, but somehow, upon glancing at the frozen cobalt jewels a memory was sparked. One where my husband and I sat huddled over a baking dish, spoons greedily digging into soft and syrupy pudding, warming our bellies with its deliciousness. I hesitated, wondering whether I could trust a four-year-old-food-memory formed when my cooking skills were just barely beginning to bud, but time was slipping quickly so I crossed my fingers and hoped for the best. I needn't have worried :). taste: 4/5. The comfort of a pudding with the freshness of berries. This really is a simple, fluffy yet satisfying, softly sweet pudding dotted with sapphire gems and smothered in the most delicious, sticky indigo syrup. They may not look like much but boy are they wonderfully moorish. I always add a little more blueberries (once I substituted strawberries) to get more of that lip-smackingly-good syrup. I even once forgot to add any sugar to the batter and it STILL tasted good. Thanks pudding :). Those puddings must be divine! Yummy. Puddings are such a comforting dessert. 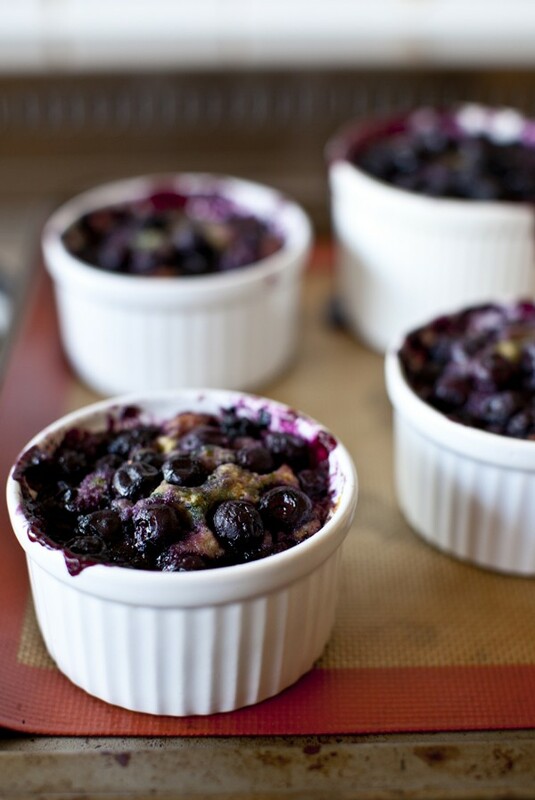 This looks fantastic, love baking with blueberries! Looks absolutely delicious and comforting! Perfect for this weather right now. I love having frozen berries on hand too, it's so handy when you want to bake something at the last minute or when things are out of season. Love these little puddings, they look delicious! Looks wonderful! 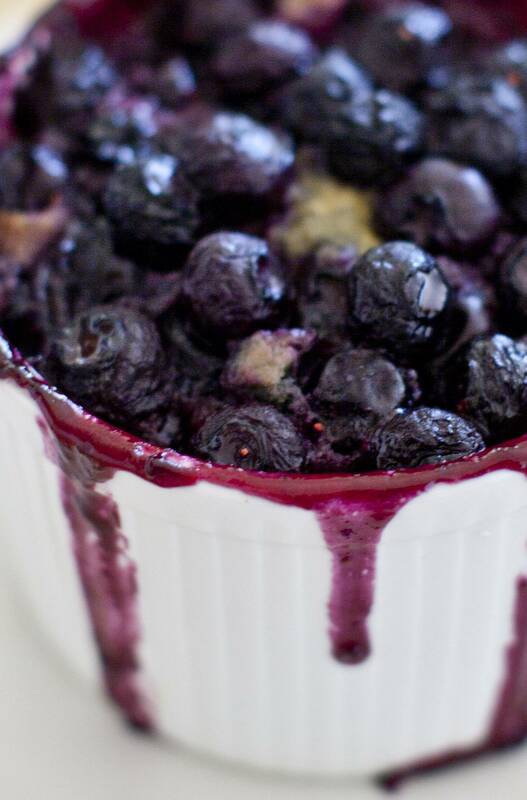 I make a blueberry crisp that's also easy and tasty. This is exactly the kind of dessert I'm known for in my family! Individual ramekin creations :) I'll definitely have to try this soon! Neat idea. When I think of pudding-cakes I always think of lemon or chocolate. I really like this recipe! This looks delicious to the taste buds and comforting to the soul. It's spring here but actually quite chill today still. Could really use some of this :). oh-so-easy and quick, but i'll be darned if it doesn't deliver in beauty and flavor. lovely. Oh wow, this looks heavenly. Like a really good, plump pudding! And still being amazing sans sugar - wow, what a gem. I'll definitely be trying this recipe, thanks! I was looking for blueberries the other week and couldn't find any - I hope they're actually in season over here at the moment because I'm now totally craving this! I don't have a sweet tooth but I'm tempted to try this!